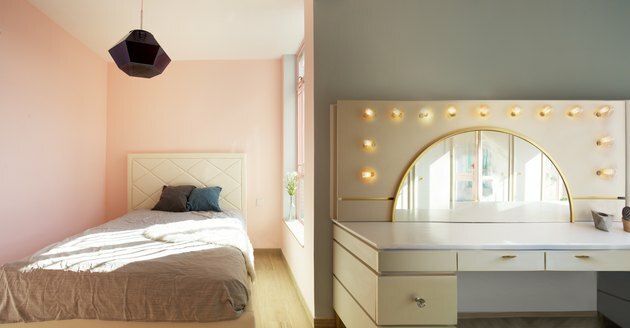 This Rosy-Hued Minimalist Apartment Was Literally Inspired by the Movie "Pretty in Pink"
Molly Ringwald's unforgettable portrayal of Andie — a high school outcast in the 1986 John Hughes film Pretty In Pink — inspired a generation of young women to don flower hats, make handmade jewelry, and of course, embrace the color pink with her "volcanic" ensembles (as her best friend Duckie described in the film). And you know who else was inspired by the '80s flick? 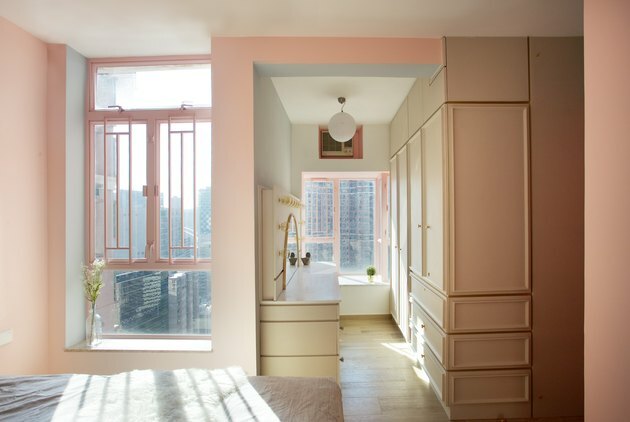 Hong Kong-based architectural firm Sim-Plex Design Studio, who actually went so far as to design a Pretty In Pink-influenced apartment. They transformed a mundane 493-square-foot space into a calm and feminine home exuding just the right amount of colorful charm. Located in Tsuen Wan, Hong Kong, Sim-Plex's goal was to create a space that reflected their young client's personality. 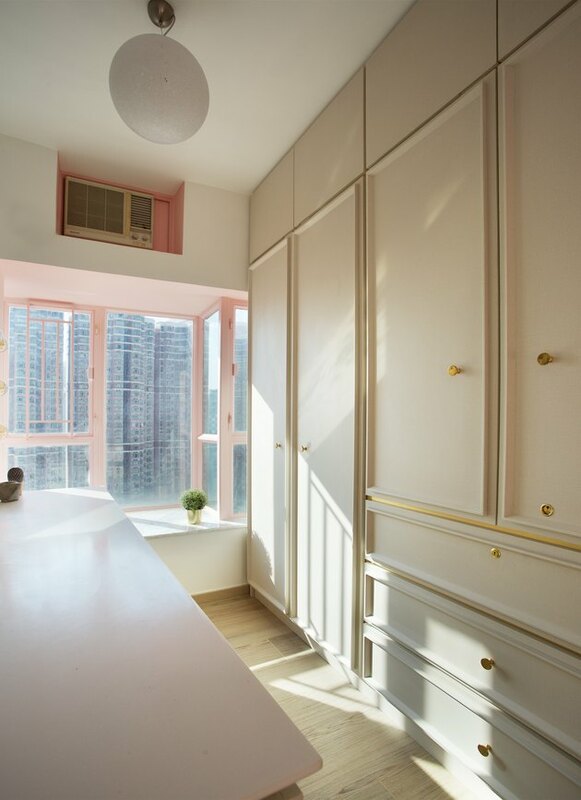 To that end the residence, complete with a dress-up corner and a vanity table, is covered in light pink and gray wall paint and is accented with gold-frame furnishings. 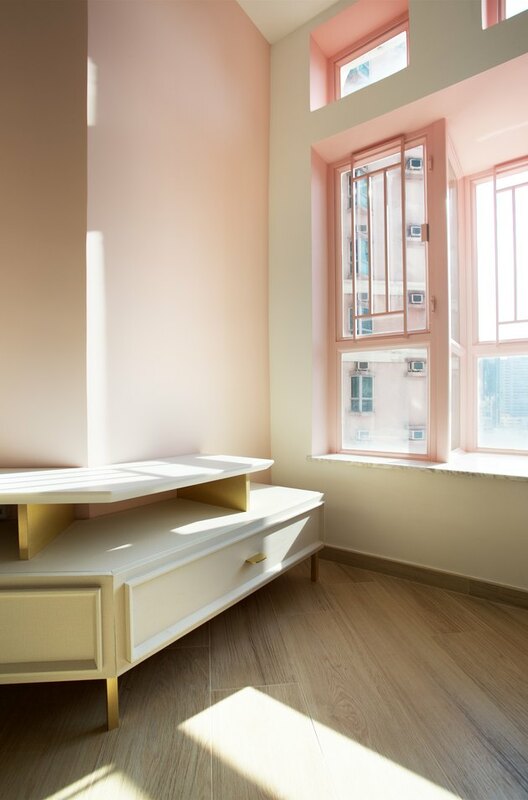 More often than not, newly-built apartments in Hong Kong are cramped, featuring mundane interiors. The designers at Sim-Plex, however, wanted to create an interior that felt spacious and intimate with plenty of natural light and minimalist furnishings that fit their client's personal needs. 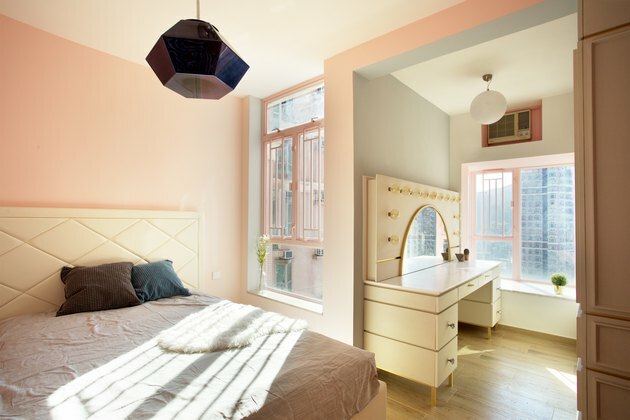 A home that began as a cramped two-bedroom was transformed into a space that any Pretty In Pink fan would adore. The client's personal furniture pieces included custom-built cabinets and closets, like the wrap-around table in the living room. The light-wood flooring helps reflect natural light, making the interior feel bright and sunny. The details that made Andie from Pretty In Pink unforgettable — her feminine energy, use of pale pink hues, sleek gold jewelry — are mirrored in the textures and materials used throughout the design. And gray paint from Nippon Paint highlights the light pink shade from start to finish. The previous layout of the apartment, which can only be described as a cramped two-bedroom dwelling, was opened up in order to make the interior more spacious. 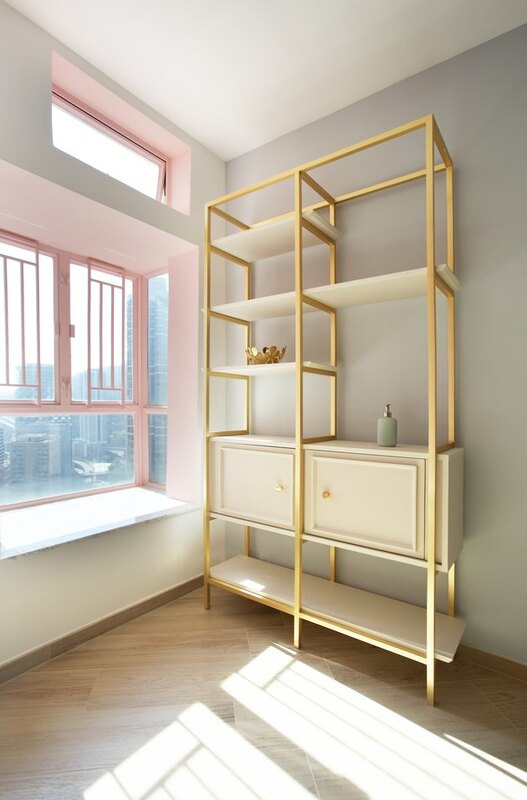 The thin gold details and pale color palette of this minimalist design make a delicate impression. 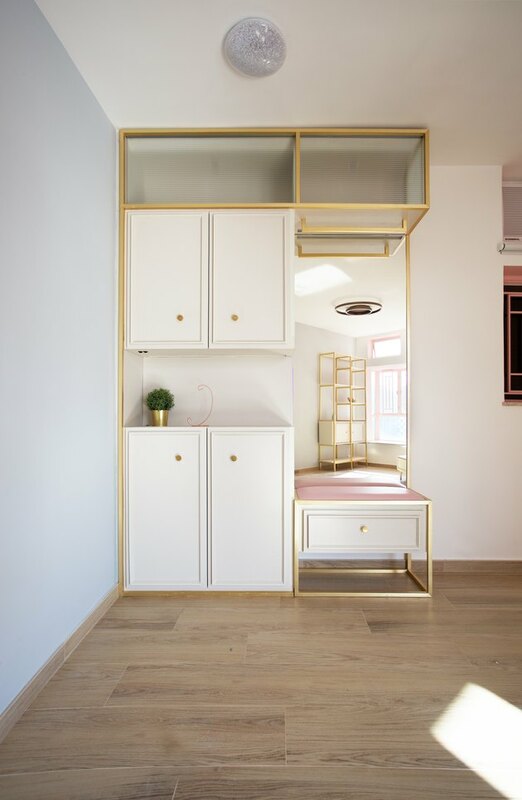 A custom storage piece combines white cabinetry with metallic gold frames. The design, which features diamond and gold door pulls, sets the aesthetic tone for the entire apartment. An eye-catching ceiling pendant light from Tom Dixon adds a darker geometric element to the room. Mixed materials add great texture to the apartment — white Corian® slabs, rubber, and gold metallics. According to the designers at Sim-Plex, it's typical for developers in Hong Kong to create spaces that feel uninspired or cramped. But for them, the answer is simple: Adding a little color makes all of the difference. 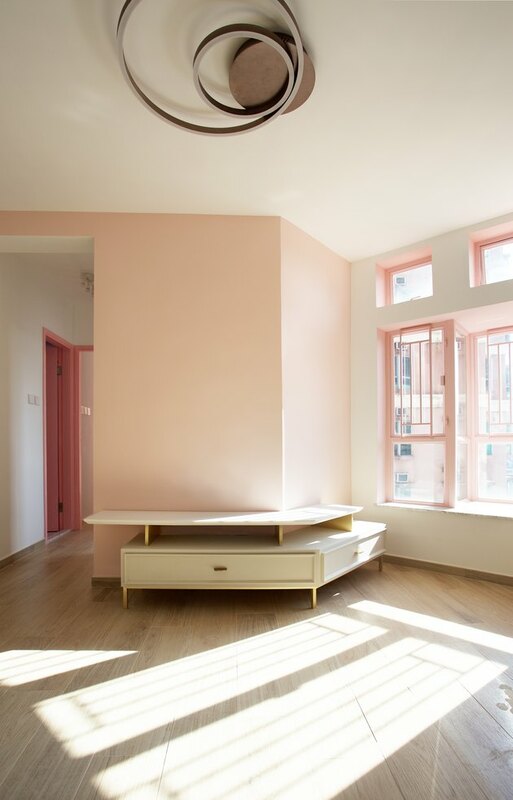 A monochromatic color palette features a mix of light- and medium-tone pink hues from Nippon Paint. A white globe ceiling light hangs over the dressing area, complete with custom built-in closets with drawers. 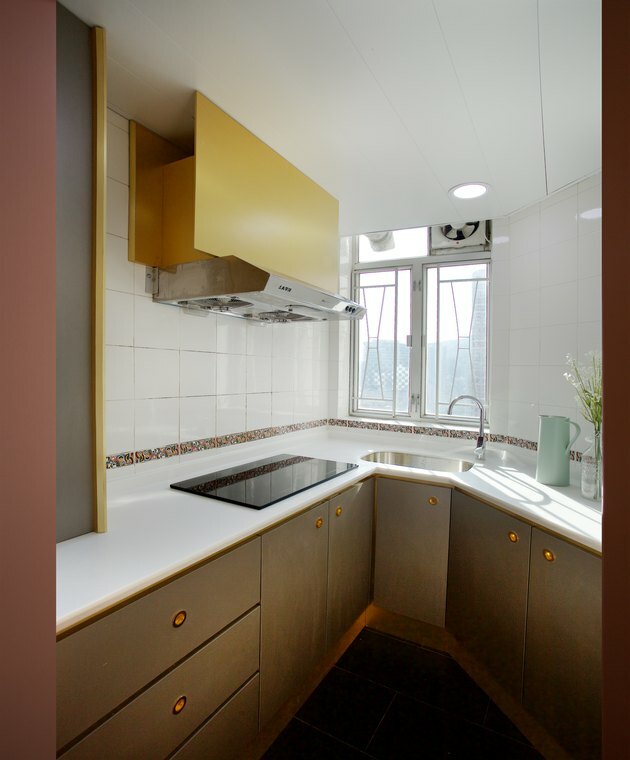 The metal enclosure for the oven's hood, designed to be the kitchen's bright focal point, was painted a golden yellow. Custom-made cabinets were made with a metallic finish and accented with gold finish hardware. The kitchen's design is restrained and organized, with its clean white Corian® countertops that are also featured in other areas of the house. In the bathroom, the vanity cabinet is made from fire-resistant rubber, topped with white Corian®, and accented with gold hardware. 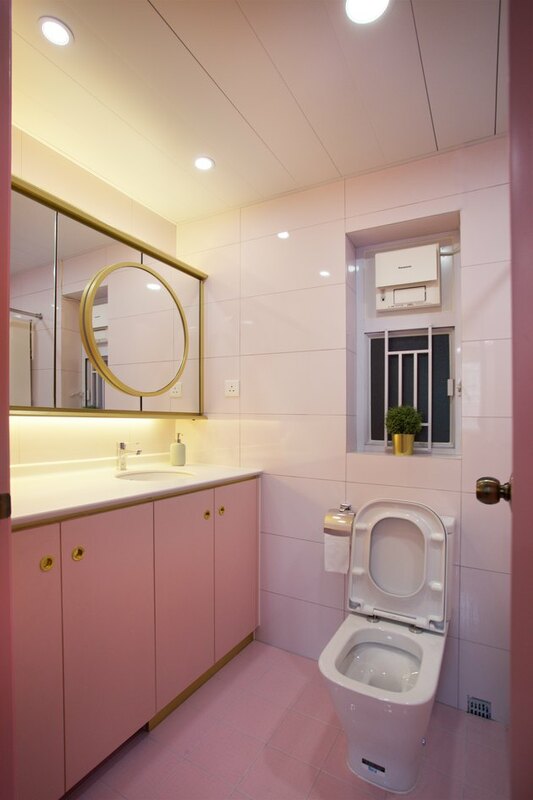 While the rest of the apartment's design leans more minimalist, the bathroom design takes on a playful vibe with hot pink floor tile and gold accessories.